The White Plains High School Boys Basketball Team has surged recently winning four straight games since Jan. 11. After losing four consecutive games, including both games in the 20th Anniversary Slam Dunk Tournament, the Tigers have regrouped to win four straight games, including two league contests. The Tigers young men won the Boys Bracket of the Lou Panzanaro, Sr. Tournament, held at Peekskill High School. 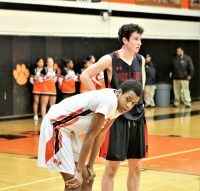 The Tigers beat Lincoln High School from Yonkers, 74-57, in the Opening Round, on Friday, Jan. 11. They returned the next day to capture the Championship of the Panzanaro Tourney by edging the host Red Devils, 79-77. The Tigers first league win this season came at Ossining High School, when their offense put 80 points on the scoreboard and their defense held the Pride to 68 points on Jan. 15. “We played some really good competition during our four losses and we learned from it,” commented Head Coach Spencer Mayfield. “We are starting to reach our offensive potential while moving the basketball a lot better; when the ball moves the scoreboard moves,” said Mayfield. The Tigers are certainly “reaching the offensive potential.” They scored 233 total points during their three-game winning streak on the road. Then they returned to White Plains High School to beat Fox Lane, 69-61, for their fourth straight win and second league victory. Fox Lane proved to be stiff competition for the Tigers. Foxes senior Joshua Olsen scored 24 points and junior William Crerend added 15 points. But Tigers junior Eisaiah Murphy countered with 22 points complemented by junior Jayon Norwood’s 14 points to get the win. Murphy scored 12 points in the third quarter on four straight three-pointers, which increased the Tigers lead to 13 points, 59-46, at the end of the third quarter. But the “fox hunt” was not over as the Foxes bounced back to close the gap to within three points at 2:39 of the fourth quarter. As the Foxes gained momentum in the fourth quarter, Murphy missed a jumper but Norwood leaped over everybody for the offensive rebound and put-back to squelch the Foxes comeback. It was definitely the play of the game. “I did not realize how big a play it was; I had the better position so I just jumped up and put it back,” said Norwood. Tigers junior Quion Burns had 11 points, sophomore Joe Carrier scored nine points, sophomore Mekhi Woodbury contributed six points and seven assists and junior Paul Sevcik grabbed four rebounds and scored three points in the Tigers win. “Tonight was a good team-win because we got a lot of contributions from various players,” said Mayfield. The Tigers will try to continue their success in Section 1 AA League competition when they host Scarsdale High School, on Wednesday, Jan. 23 and the Ossining Pride, on Friday, Jan. 25. Both games are scheduled for 4:30 p.m. in the Harry Jefferson Gym at White Plains High School.